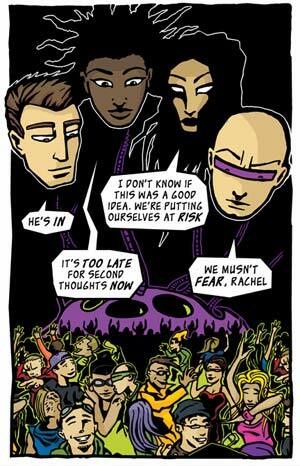 This was one of the hardest introductions I've ever had to write. Ranks right up there with ... well, I could name names, but just trust me on this. It's been difficult. Why might that be? Fair question. Until he took it to the next unforeseen, but completely "logical" [not really the correct word, but it works] step and proceeded to completely blow your mind open to something strange and beautiful which you would never have considered before. And then there's always his fiction, which is where things started to get really interesting -- and truly, wonderfully weird and inventive. All of which brings us to Club Zero-G, his first graphic novel, which was recently released by the fiercely independent-minded press, Disinformation. If I was to note that it combines all of Rushkoff's particular interests in a whole new package that's perfectly suited to present his revolutionary ideas in a manner that's not just entertaining and insightful, but also incite-ful ... well, that would be a bit of an understatement. 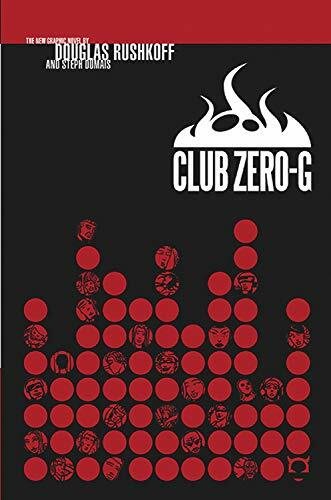 Bill Baker: How would you describe the Club Zero-G graphic novel to someone who hasn't encountered it yet? 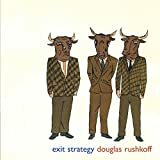 Douglas Rushkoff: I guess that would depend on who I'm talking to. 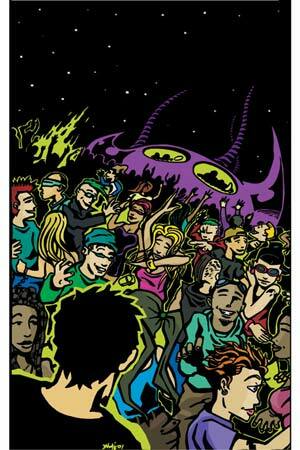 To most people, I explain the main plot element: a bunch of kids find a perfect dance party that they can only get to in their sleep. Just one of them can remember the place during waking reality, and has to convince everyone that it exists. It turns out to be a psychic field being created by some beings from the future who are attempting to overturn consensus reality. To my intellectual friends, I explain that it's an exploration of reception theory, some of Foucault's ideas, and those of Roland Barthes, using the cut-up environment of the comic book to convey the potential for autonomy and self-authorship. To my comics and chaos friends - like Grant Morrison or Genesis P-Orridge - I say that the book is a sigil meant to make people aware that we're living in an open source reality. To my mom, I say it's a love story. BB: You've published in a number of different media, literatures and genres over the years, but this marks your first foray into comics. Which leads me to ask the obvious: what took you so long to get into comics? DR: Well, I'm a busy guy. All these genres take time! And not all of them pay. Part of the reason I didn't do comics until now is because I don't draw. Comics is such a visual medium, that it seemed somehow inappropriate for me to jump in and write scripts that a real artist would then have to draw. But the real reason is that I couldn't find a way to do it. I tried to get in touch with the major publishers, but they weren't interested in meeting with me. I've always wanted to bring back The Eternals (the one title I read as a kid that wasn't DC, but Kirby transcends all boundaries) and work for a while from the Deviants' point of view. Or begin the story on the morning that the Celestials are supposed to decide the fate of our planet, have them vote thumbs down, and then play out the war between earth and the Unimind. But I digress. I've been writing about and teaching the comics medium since I wrote the non-fiction book Playing the Future, back in 1995, about how comics are training for a chaotic universe, where pattern recognition and learning to read between the panels is more important than linear sense. So I saw comics, video games, meta-conscious media like MST3K or The Simpsons, FRP's, and goth/magick as part of the same cultural movement - and the very thing that would replace the hierarchically ordered and highly specialized world we've been living in pretty much since the Renaissance. I just never felt quite qualified to jump in and do it - and the gatekeepers didn't seem to think I was qualified, either. Luckily, Disinformation already knew me well from my books, and saw me as a likely bridge between their own history and their hopes for a future in more graphical media. BB: So how much of an adjustment did you have to make as a writer moving from largely prose-based works into what is essentially a graphic-intensive medium? DR: A total adjustment in some ways. In books, you write the content itself. 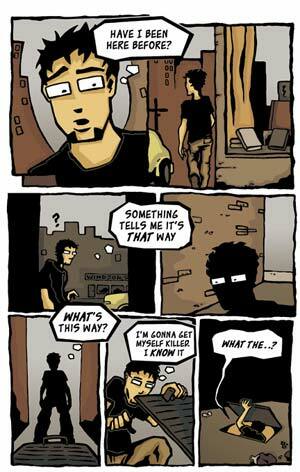 In comics, you imply everything through negative space. So it's a matter of learning to write tiny cues on the edges of the narrative, through which the reader implies the whole of the reality of the story. This makes graphic novels a much 'cooler' medium, in McLuhan's sense of the word - meaning, the reader has to do a lot more, connecting things, making assumptions, and being a generally more active partner in making meaning. So, in that way, it's a whole lot less work. I get the benefit of an active reader. But this also means, as a person used to just saying everything, I had to learn how to not say, how to imply, and how to allow for a certain amount of disorientation. It was a lot like writing a screenplay, where you have to learn to give the director - or, in this case, the artist - enough information to know what you mean, but then not so much that they feel boxed in. So, again, it's a matter of implying exactly what's in each frame without coming right out and saying it. 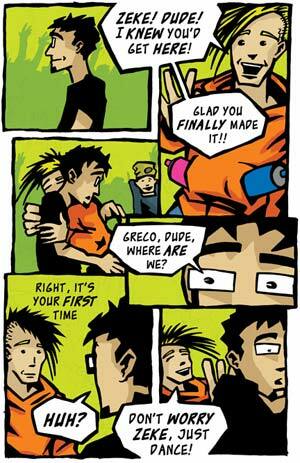 BB: What about the nature of this particular story leant itself to being realized as a graphic novel? DR: Well, what I've just described is an extreme form of reception theory. The whole idea that the world we live in is a matter of interpretation - and that it's our job as agents of consciousness to take on that responsibility. This is what my story is about, and it's also the consciousness people need to adopt if they're going to be able to engage with a comic book. 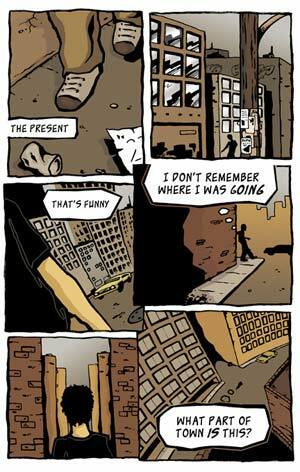 So the graphic novel, as a medium, is perfectly matched to the story I've been trying to tell about our reality. And the process of reading it should be an experiential analogue to the story inside it. BB: One of the things about the work that really impressed me was how easily the visual and verbal channels moved between the real and dream worlds, how naturally and gimmick-less those transitions were for the reader. How hard was that to achieve as a writer... and is that one of the reasons that Steph Dumais was chosen to visually realize Club Zero-G? DR: Well, I learned the trick about transitions when I was a kid, from an acting book of all places. The guy (Michael Shurtleif) had this whole chapter on transitions, where all he said is, "there aren't any." And that really stuck with me. There's no such thing as a transition. You're doing one thing, and then you're doing something else. Transitions are interpretations after the fact. When you're living them, they're just what they are. So I wrote the movements between worlds as just-before and just-after. What's the experience of the character as he is moving from one world to another? Is it a subtle shift? If so, then where is he right then? He's not between, he's somewhere. It just might be a fuzzy place. Or in one frame, we show him in no place. He's just in the black. But that's not a transition as far as he's concerned. He's in pitch blackness! The other thing that really helped were the changes in palette. We talked a lot about that, but it's what makes it easy to see that you've moved into a different reality. There's really five or six of them, each with its own range of hues. Yeah - I chose Steph (controversially, it seems) because he's so straightforward. He's also the only one I really considered. I had mentioned somewhere on one of my mailing lists that I was considering getting into comics, and then he emailed me and said if I ever do, he'd like to draw it. I liked that his style was a bit different - a bit rougher than most of the stuff (anime) I'd been reading at the time, and thought it could serve as a good response to that hyper-delicate stuff. Make it more emotional. BB: How did you and Steph work on the book? Did you simply create a script which he was then expected to realize visually, or was there more of a collaborative spirit, some real give and take, between the two of you? DR: There wasn't a whole lot of give and take, mostly because of time. And at the beginning, I tended to call all the shots because I'm older and originated the thing. 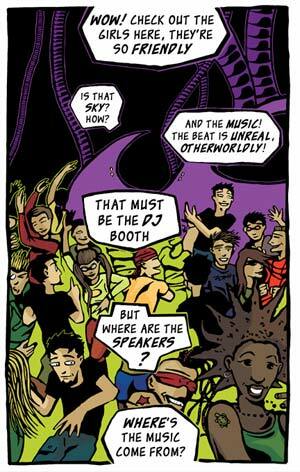 It started as a serialization in a rave magazine called BPM. So I'd just send an 8 or 16-page script, and then he'd draw it. When we got the book deal, I wrote the last 80 or so pages all at once. And he had some suggestions to those which I incorporated - most significantly, a bigger battle at the end. And that was an important addition - even though I ended up undermining its importance with dialogue, just to make sure people know that the battle is not at all the climax. The main thing we went back and forth on was the looks of the characters. That was the hardest part. Once we were in agreement on what the people looked like, the rest just flew. So although there wasn't a lot of active collaboration (Steph is in Poland, I'm in New York) Steph was responsible for the whole look and feel of these worlds. BB: How happy are you with the results of this experiment? And might we see a sequel to Zero-G, or something completely new in the medium from you in the future? DR: I'd like to do another. I suppose that will have something to do with how this one sells. I want to do something stranger - more literary, I suppose - next time. I've got a story about species fertility that I'm working on, called Ovopositum. It'd be deeply weird, and much less of a genre satire than Club Zero-G is. Zero-G, as my entree to this medium, spends some time deconstructing the values of the superhero and anime genres. I felt I had to do a comic that was, in some ways, about comics. Certainly as my first effort. Now that that's over with, I want to get weird. And I'd also jump at the opportunity to reinterpret one of the DC or Marvel stories. I know they're hiring some writers established in other genres to do that. Can you put in a word for me? Well, at the risk of spoiling it, I have to note that I found that the ending was fairly open ended and... well, demanding of the reader. While not a revolutionary ending, literary-wise, I did get the distinct impression that you really wanted to incite a revolution of the mind, if not spirit, with this work. Am I close to the truth here, or just blowing smoke? DR: You're totally close to the truth. Spot on it. I mean, look at the endings of Star Wars (the first trilogy) or The Matrix. Argh. Closure is so...closed. It's no longer enough for an author to demonstrate one way for people to get out of their mess. God bless Joseph Campbell, but the structure of mythology must change to match the growth of human agency as part of the equation. It's the responsibility of storytellers to give people some of the tools and wisdom they need to get themselves out of the mess we're all in. This is not so very new. Remember, many Victorian novelists would write two endings for their books. Great Expectations, French Lieutenant's Woman, and many others, all have multiple conclusions. That's a beginning of bringing reader reception to the table. I've tried to take that to the next level. Really, I'd like to create a way for users to continue the story, or to take it out to another level of reality. 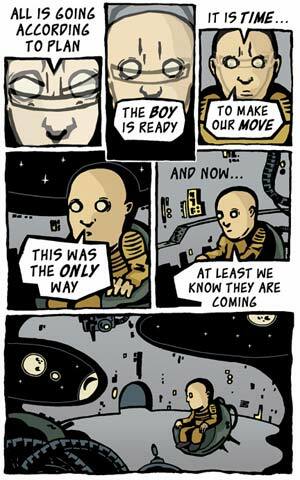 It's what I did with my novel, Exit Strategy, and it would be a very interesting way to play with comics in a more interactive mediaspace. BB: Is that indicative of what you'd like the reader to get from this book, or is it more of a mixture of two seemingly at-odds goals, the thoughtful compounded with pure entertainment? And how might that contrast with your other endeavors? DR: Well, thought and entertainment always seem a bit at odds. I mean, it's like the author wants to transmit some important ideas to the reader, but he has to spin a yarn in order to get the reader's attention. It's like, you have to deliver the drug that they're paying for, and so you try to lace it with your message. At least it feels like that sometimes - as if the audience is some guy with a gun saying "dance, boy!" But when the story, the genre, the medium, and the theme all merge, then it's magic. (Or magick.) Then you're really happy that there's an audience who won't be attracted unless you create an artifact worthy of attention - because you only get there if you've worked out the kinks, and gotten your own agendas out of the way of the characters' or the story's. Ultimately, if you're going to play around with myth, you've got to disappear. BB: What did you get, be it personally or professionally, from doing this particular project that you don't get from teaching, your other writing efforts, or even playing with PsychicTV? DR: Well, for one, I'm hoping to have reached a new audience. There's a lot of people who might not have the interest to crack one of my three-hundred page books. So how to reach them with these ideas? Use a genre that they're comfortable with. More importantly, for me, working in this medium challenges me to live in the place I've been writing about. It's been great to write about non-linear spaces by using a linear medium, but this is a chance to play in that space, myself. I've been arguing for years that comics and graphic novels are environments where extraordinarily intense ideas are being exchanged. This was my chance to see if the medium could carry some of my own more complex thought constructs. Finally, I wanted to enter the conversation. It'd take me a long time to explain, but Grant and I have been having a conversation for years about the power of magick, and the nature of reality. In a certain way, this is an answer to him. Little Bebe is my King Mob. DR: Well, first of all it'd be please read my graphic novel. And enjoy it! Oh. One more thing. Please no one confuse movies with comics. They are such very different media. Yes, it's cool for a comic book to be made into a movie. But that's not necessarily a sign of the comic book's greatness. It's not the goal. 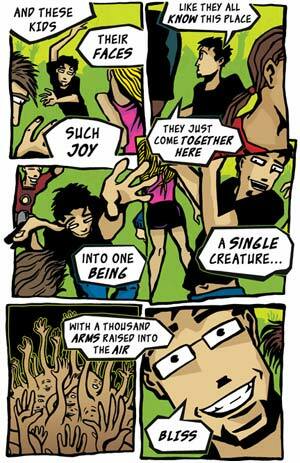 For more of Douglas Rushkoff's insightful explorations of comics, the larger media complex and the world we live in and how it got that way, head on over to www.rushkoff.com. To learn more about Douglas Rushkoff's Club Zero-G, or to buy a copy of this richly entertaining and thought-provoking graphic novel, go to the Disinformation website at www.disinfo.com. And while you're there, don't forget to check out the rest of their offerings, such as the excellent Anarchy for the Masses, a lexicon for Grant Morrison's Invisibles series, the ridiculously sublime Disinformation: The Interviews, which includes conversations with Rushkoff, Grant Morrison, Robert Anton Wilson and a bevy of other radical thinkers and doers, as well as other volumes and films which will be of real interest to any and all seekers of the Truth. You know who you are. Now go, and change the world.